Third book in the series begins with a reminder that Cat's evil son of a dad isn't dead, and that promises a confrontation in the future. While Cat continues with undercover work baiting naughty human killing vampires, Bones is made to keep his promise of turning Cat's team member to a vampire, to everyone's surprise it turns out be Tate, who still carries a torch for Cat. As if it's not enough to disrupt the couple from settling into living together again, daddy is back and has his mind set on killing Cat. Bones is forced to give a public demonstration on just what happens to vampires who go after Cat, and it won't be subtle. But there is much more brewing under the surface, and neither Cat or Bones have any idea what is coming after them and just how powerful they are and how much they are willing to do to see the death of them both. Cat and Bones are joined by Ian, Spade and Mencheres and Vlad who has a bite more interesting history behind him. 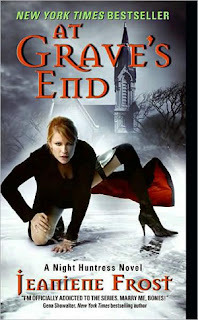 Jeanine Frost writes like adventure film on screen, this book like the two before is fast pace, thrilling ride with vampires, ghouls and one pissed off mother. The book is definitely a grabber and it's hard to put down. I love the action and the few romantic, tummy twisting steamy lines and scenes! Definitely worth reading.